Reflect, what could have been the motive for such deeds? What could have prompted such behavior towards the Revealers of the beauty of the All-Glorious? Whatever in days gone by hath been the cause of the denial and opposition of those people hath now led to the perversity of the people of this age. To maintain that the testimony of Providence was incomplete, that it hath therefore been the cause of the denial of the people, is but open blasphemy. How far from the grace of the All-Bountiful and from His loving providence and tender mercies it is to single out a soul from amongst all men for the guidance of His creatures, and, on one hand, to withhold from Him the full measure of His divine testimony, and, on the other, inflict severe retribution on His people for having turned away from His chosen One! Nay, the manifold bounties of the Lord of all beings have, at all times, through the Manifestations of His divine Essence, encompassed the earth and all that dwell therein. Not for a moment hath His grace been withheld, nor have the showers of His loving-kindness ceased to rain upon mankind. Consequently, such behavior can be attributed to naught save the petty-mindedness of such souls as tread the valley of arrogance and pride, are lost in the wilds of remoteness, walk in the ways of their idle fancy, and follow the dictates of the leaders of their faith. Their chief concern is mere opposition; their sole desire is to ignore the truth. Unto every discerning observer it is evident and manifest that had these people in the days of each of the Manifestations of the Sun of Truth sanctified their eyes, their ears, and their hearts from whatever they had seen, heard, and felt, they surely would not have been deprived of beholding the beauty of God, nor strayed far from the habitations of glory. But having weighed the testimony of God by the standard of their own knowledge, gleaned from the teachings of the leaders of their faith, and found it at variance with their limited understanding, they arose to perpetrate such unseemly acts. Leaders of religion, in every age, have hindered their people from attaining the shores of eternal salvation, inasmuch as they held the reins of authority in their mighty grasp. Some for the lust of leadership, others through want of knowledge and understanding, have been the cause of the deprivation of the people. By their sanction and authority, every Prophet of God hath drunk from the chalice of sacrifice, and winged His flight unto the heights of glory. What unspeakable cruelties they that have occupied the seats of authority and learning have inflicted upon the true Monarchs of the world, those Gems of divine virtue! Content with a transitory dominion, they have deprived themselves of an everlasting sovereignty. Thus, their eyes beheld not the light of the countenance of the Well-Beloved, nor did their ears hearken unto the sweet melodies of the Bird of Desire. For this reason, in all sacred books mention hath been made of the divines of every age. Thus He saith: “O people of the Book! Why disbelieve the signs of God to which ye yourselves have been witnesses?” And also He saith: “O people of the Book! Why clothe ye the truth with falsehood? Why wittingly hide the truth?” Again, He saith: “Say, O people of the Book! Why repel believers from the way of God?” It is evident that by the “people of the Book,” who have repelled their fellowmen from the straight path of God, is meant none other than the divines of that age, whose names and character have been revealed in the sacred books, and alluded to in the verses and traditions recorded therein, were you to observe with the eye of God. These are the “clouds” that cause the heavens of the knowledge and understanding of all that dwell on earth to be cloven asunder. Even as He hath revealed: “On that day shall the heaven be cloven by the clouds.” Even as the clouds prevent the eyes of men from beholding the sun, so do these things hinder the souls of men from recognizing the light of the divine Luminary. To this beareth witness that which hath proceeded out of the mouth of the unbelievers as revealed in the sacred Book: “And they have said: ‘What manner of apostle is this? He eateth food, and walketh the streets. Unless an angel be sent down and take part in His warnings, we will not believe.’” Other Prophets, similarly, have been subject to poverty and afflictions, to hunger, and to the ills and chances of this world. As these holy Persons were subject to such needs and wants, the people were, consequently, lost in the wilds of misgivings and doubts, and were afflicted with bewilderment and perplexity. How, they wondered, could such a person be sent down from God, assert His ascendancy over all the peoples and kindreds of the earth, and claim Himself to be the goal of all creation—even as He hath said: “But for Thee, I would not have created all that are in heaven and on earth”—and yet be subject to such trivial things? You must undoubtedly have been informed of the tribulations, the poverty, the ills, and the degradation that have befallen every Prophet of God and His companions. You must have heard how the heads of their followers were sent as presents unto different cities, how grievously they were hindered from that whereunto they were commanded. Each and every one of them fell a prey to the hands of the enemies of His Cause, and had to suffer whatsoever they decreed. It is evident that the changes brought about in every Dispensation constitute the dark clouds that intervene between the eye of man’s understanding and the divine Luminary which shineth forth from the dayspring of the divine Essence. Consider how men for generations have been blindly imitating their fathers, and have been trained according to such ways and manners as have been laid down by the dictates of their Faith. Were these men, therefore, to discover suddenly that a Man, Who hath been living in their midst, Who, with respect to every human limitation, hath been their equal, had risen to abolish every established principle imposed by their Faith—principles by which for centuries they have been disciplined, and every opposer and denier of which they have come to regard as infidel, profligate and wicked—they would of a certainty be veiled and hindered from acknowledging His truth. Such things are as “clouds” that veil the eyes of those whose inner being hath not tasted the Salsabíl of detachment, nor drunk from the Kawthar of the knowledge of God. Such men, when acquainted with these circumstances, become so veiled that without the least question, they pronounce the Manifestation of God an infidel, and sentence Him to death. You must have heard of such things taking place all down the ages, and are now observing them in these days. This dark power has always endeavored to extinguish the light. Tyranny has ever sought to overcome justice. Ignorance has persistently tried to trample knowledge underfoot. This has, from the earliest ages, been the method of the material world. In the time of Moses, Pharaoh set himself to prevent the Mosaic Light being spread abroad. In the day of Christ, Annas and Caiaphas inflamed the Jewish people against Him and the learned doctors of Israel joined together to resist His Power. All sorts of calumnies were circulated against Him. The Scribes and Pharisees conspired to make the people believe Him to be a liar, an apostate, and a blasphemer. They spread these slanders throughout the whole Eastern world against Christ, and caused Him to be condemned to a shameful death! In the case of Muḥammad also, the learned doctors of His day determined to extinguish the light of His influence. They tried by the power of the sword to prevent the spread of His teaching. In spite of all their efforts the Sun of Truth shone forth from the horizon. In every case the army of light vanquished the powers of darkness on the battlefield of the world, and the radiance of the Divine Teaching illumined the earth. Those who accepted the Teaching and worked for the Cause of God became luminous stars in the sky of humanity. Now, in our own day, history repeats itself. Those who would have men believe that religion is their own private property once more bring their efforts to bear against the Sun of Truth: they resist the Command of God; they invent calumnies, not having arguments against it, neither proofs. They attack with masked faces, not daring to come forth into the light of day. Our methods are different, we do not attack, neither calumniate; we do not wish to dispute with them; we bring forth proofs and arguments; we invite them to confute our statements. They cannot answer us, but instead, they write all they can think of against the Divine Messenger, Bahá’u’lláh. Do not let your hearts be troubled by these defamatory writings! Obey the words of Bahá’u’lláh and answer them not. Rejoice, rather, that even these falsehoods will result in the spread of the truth. When these slanders appear inquiries are made, and those who inquire are led into a knowledge of the Faith. If a man were to declare, “There is a lamp in the next room which gives no light,” one hearer might be satisfied with his report, but a wiser man goes into the room to judge for himself, and behold, when he finds the light shining brilliantly in the lamp, he knows the truth! Again, a man proclaims: “There lies a garden in which there are trees with broken branches bearing no fruit, and the leaves thereof are faded and yellow! In that garden, also, there are flowering plants with no blooms, and rose bushes withered and dying—go not into that garden!” A just man, hearing this account of the garden, would not be content without seeing for himself whether it be true or not. He, therefore, enters the garden, and behold, he finds it well tilled; the branches of the trees are sturdy and strong, being also loaded with the sweetest of ripe fruits amongst the luxuriance of beautiful green leaves. The flowering plants are bright with many-hued blossoms; the rose bushes are covered with fragrant and lovely roses and all is verdant and well tended. When the glory of the garden is spread out before the eyes of the just man, he praises God that, through unworthy calumny, he has been led into a place of such wondrous beauty! This is the result of the slanderer’s work: to be the cause of guiding men to a discovery of the truth. We know that all the falsehoods spread about Christ and His apostles and all the books written against Him, only led the people to inquire into His doctrine; then, having seen the beauty and inhaled the fragrance, they walked evermore amidst the roses and the fruits of that celestial garden. Therefore, I say unto you, spread the Divine Truth with all your might that men’s intelligence may become enlightened; this is the best answer to those who slander. I do not wish to speak of those people nor to say anything ill of them—only to tell you that slander is of no importance! Clouds may veil the sun, but, be they never so dense, his rays will penetrate! Nothing can prevent the radiance of the sun descending to warm and vivify the Divine Garden. Nothing can prevent the fall of the rain from Heaven. Nothing can prevent the fulfillment of the Word of God! Therefore when you see books and papers written against the Revelation, be not distressed, but take comfort in the assurance that the cause will thereby gain strength. No one casts stones at a tree without fruit. No one tries to extinguish a lamp without light! O God! Dispel all those elements which are the cause of discord, and prepare for us all those things which are the cause of unity and accord! O God! Descend upon us Heavenly Fragrance and change this gathering into a gathering of Heaven! Grant to us every benefit and every food. Prepare for us the Food of Love! Give to us the Food of Knowledge! Bestow upon us the Food of Heavenly Illumination! In your hearts remember these things, and then enter the Unity Feast. Each one of you must think how to make happy and pleased the other members of your Assembly, and each one must consider all those who are present as better and greater than himself, and each one must consider himself less than the rest. Know their station as high, and think of your own station as low. Should you act and live according to these behests, know verily, of a certainty, that that Feast is the Heavenly Food. That Supper is the “Lord’s Supper”! I am the Servant of that gathering. The first teaching of Bahá’u’lláh is the duty incumbent upon all to investigate reality. What does it mean to investigate reality? It means that man must forget all hearsay and examine truth himself, for he does not know whether statements he hears are in accordance with reality or not. Wherever he finds truth or reality, he must hold to it, forsaking, discarding all else; for outside of reality there is naught but superstition and imagination. For example, during the days of Jesus Christ the Jews were expecting the appearance of the Messiah, praying and beseeching God day and night that the Promised One might appear. Why did they reject Him when He did appear? They denied Him absolutely, refused to believe in Him. There was no abuse and persecution which they did not heap upon Him. They reviled Him with curses, placed a crown of thorns upon His head, led Him through the streets in scorn and derision and finally crucified Him. Why did they do this? Because they did not investigate the truth or reality of Christ and were not able to recognize Him as the Messiah of God. Had they investigated sincerely for themselves, they would surely have believed in Him, respected Him and bowed before Him in reverence. They would have considered His manifestation the greatest bestowal upon mankind. They would have accepted Him as the very Savior of man; but, alas, they were veiled, they held to imitations of ancestral beliefs and hearsay and did not investigate the truth of Christ. They were submerged in the sea of superstitions and were, therefore, deprived of witnessing that glorious bounty; they were withheld from the fragrances or breaths of the Holy Spirit and suffered in themselves the greatest debasement and degradation. Reality or truth is one, yet there are many religious beliefs, denominations, creeds and differing opinions in the world today. Why should these differences exist? Because they do not investigate and examine the fundamental unity, which is one and unchangeable. If they seek reality itself, they will agree and be united; for reality is indivisible and not multiple. It is evident, therefore, that there is nothing of greater importance to mankind than the investigation of truth. In the world of existence man has traversed successive degrees until he has attained the human kingdom. In each degree of his progression he has developed capacity for advancement to the next station and condition. While in the kingdom of the mineral he was attaining the capacity for promotion into the degree of the vegetable. In the kingdom of the vegetable he underwent preparation for the world of the animal, and from thence he has come onward to the human degree, or kingdom. Throughout this journey of progression he has ever and always been potentially man. In the beginning of his human life man was embryonic in the world of the matrix. There he received capacity and endowment for the reality of human existence. The forces and powers necessary for this world were bestowed upon him in that limited condition. In this world he needed eyes; he received them potentially in the other. He needed ears; he obtained them there in readiness and preparation for his new existence. The powers requisite in this world were conferred upon him in the world of the matrix so that when he entered this realm of real existence he not only possessed all necessary functions and powers but found provision for his material sustenance awaiting him. Therefore, in this world he must prepare himself for the life beyond. That which he needs in the world of the Kingdom must be obtained here. Just as he prepared himself in the world of the matrix by acquiring forces necessary in this sphere of existence, so, likewise, the indispensable forces of the divine existence must be potentially attained in this world. What is he in need of in the Kingdom which transcends the life and limitation of this mortal sphere? That world beyond is a world of sanctity and radiance; therefore, it is necessary that in this world he should acquire these divine attributes. In that world there is need of spirituality, faith, assurance, the knowledge and love of God. These he must attain in this world so that after his ascension from the earthly to the heavenly Kingdom he shall find all that is needful in that eternal life ready for him. That divine world is manifestly a world of lights; therefore, man has need of illumination here. That is a world of love; the love of God is essential. It is a world of perfections; virtues, or perfections, must be acquired. That world is vivified by the breaths of the Holy Spirit; in this world we must seek them. That is the Kingdom of everlasting life; it must be attained during this vanishing existence. By what means can man acquire these things? How shall he obtain these merciful gifts and powers? First, through the knowledge of God. Second, through the love of God. Third, through faith. Fourth, through philanthropic deeds. Fifth, through self-sacrifice. Sixth, through severance from this world. Seventh, through sanctity and holiness. Unless he acquires these forces and attains to these requirements, he will surely be deprived of the life that is eternal. But if he possesses the knowledge of God, becomes ignited through the fire of the love of God, witnesses the great and mighty signs of the Kingdom, becomes the cause of love among mankind and lives in the utmost state of sanctity and holiness, he shall surely attain to second birth, be baptized by the Holy Spirit and enjoy everlasting existence. Is it not astonishing that although man has been created for the knowledge and love of God, for the virtues of the human world, for spirituality, heavenly illumination and eternal life, nevertheless, he continues ignorant and negligent of all this? Consider how he seeks knowledge of everything except knowledge of God. For instance, his utmost desire is to penetrate the mysteries of the lowest strata of the earth. Day by day he strives to know what can be found ten meters below the surface, what he can discover within the stone, what he can learn by archaeological research in the dust. He puts forth arduous labors to fathom terrestrial mysteries but is not at all concerned about knowing the mysteries of the Kingdom, traversing the illimitable fields of the eternal world, becoming informed of the divine realities, discovering the secrets of God, attaining the knowledge of God, witnessing the splendors of the Sun of Truth and realizing the glories of everlasting life. He is unmindful and thoughtless of these. How much he is attracted to the mysteries of matter, and how completely unaware he is of the mysteries of Divinity! Nay, he is utterly negligent and oblivious of the secrets of Divinity. How great his ignorance! How conducive to his degradation! It is as if a kind and loving father had provided a library of wonderful books for his son in order that he might be informed of the mysteries of creation, at the same time surrounding him with every means of comfort and enjoyment, but the son amuses himself with pebbles and playthings, neglectful of all his father’s gifts and provision. How ignorant and heedless is man! The Father has willed for him eternal glory, and he is content with blindness and deprivation. The Father has built for him a royal palace, but he is playing with the dust; prepared for him garments of silk, but he prefers to remain unclothed; provided for him delicious foods and fruits, while he seeks sustenance in the grasses of the field. Praise be to God! You have heard the call of the Kingdom. Your eyes are opened; you have turned to God. Your purpose is the good pleasure of God, the understanding of the mysteries of the heart and investigation of the realities. Day and night you must strive that you may attain to the significances of the heavenly Kingdom, perceive the signs of Divinity, acquire certainty of knowledge and realize that this world has a Creator, a Vivifier, a Provider, an Architect—knowing this through proofs and evidences and not through susceptibilities, nay, rather, through decisive arguments and real vision—that is to say, visualizing it as clearly as the outer eye beholds the sun. In this way may you behold the presence of God and attain to the knowledge of the holy, divine Manifestations. You must come into the knowledge of the divine Manifestations and Their teachings through proofs and evidences. You must unseal the mysteries of the supreme Kingdom and become capable of discovering the inner realities of things. Then shall you be the manifestations of the mercy of God and true believers, firm and steadfast in the Cause of God. Praise be to God! The door of divine knowledge has been opened by Bahá’u’lláh, for He has laid the foundation whereby man may become acquainted with the verities of heaven and earth and has bestowed the utmost confirmation in this day. He is our Teacher and Adviser; He is our Seer and the One clement toward us. He has prepared His gifts and vouchsafed His bounties, revealed every admonition and behest, prepared for us the means of eternal glory, breathed upon us the life-quickening breaths of the Holy Spirit, opened before our faces the doors of the paradise of Abhá and caused the lights of the Sun of Truth to shine upon us. The clouds of mercy have poured down their precious rain. The sea of favor is swelling and surging toward us. The spiritual springtime has come. Infinite bounties and graces have appeared. What bestowal is greater than this? We must appreciate the divine generosity and act in accordance with the teachings of Bahá’u’lláh so that all good may be stored up for us and in both worlds we shall become precious and acceptable to God, attain to everlasting blessings, taste the delicacy of the love of God, find the sweetness of the knowledge of God, perceive the heavenly bestowal and witness the power of the Holy Spirit. This is my advice, and this is my admonition. IN this day the world is redolent with the fragrances of the robe of the Revelation of the Ancient King … and yet, they (divines)[clergy] have gathered together, and established themselves upon their seats, and have spoken that which would put an animal to shame, how much more man himself! Were they to become aware of one of their acts, and perceive the mischief it hath wrought, they would, with their own hands, dispatch themselves to their final abode. BY Him Who is the Great Announcement! The All-Merciful is come invested with undoubted sovereignty. The Balance hath been appointed, and all them that dwell on earth have been gathered together. The Trumpet hath been blown, and lo, all eyes have stared up with terror, and the hearts of all who are in the heavens and on the earth have trembled, except them whom the breath of the verses of God hath quickened, and who have detached themselves from all things. The earth hath been shaken, and the mountains have passed away, and the angels have appeared, rank on rank, before Us. Most of the people are bewildered in their drunkenness and wear on their faces the evidences of anger. Thus have We gathered together the workers of iniquity. We see them rushing on towards their idol. Say: None shall be secure this Day from the decree of God. This indeed is a grievous Day. We point out to them those that led them astray. They see them, and yet recognize them not. Their eyes are drunken; they are indeed a blind people. Their proofs are the calumnies they uttered; condemned are their calumnies by God, the Help in Peril, the Self-Subsisting. The Evil One hath stirred up mischief in their hearts, and they are afflicted with a torment that none can avert. They hasten to the wicked, bearing the register of the workers of iniquity. Such are their doings. True civilization will unfurl its banner in the midmost heart of the world whenever a certain number of its distinguished and high-minded sovereigns—the shining exemplars of devotion and determination—shall, for the good and happiness of all mankind, arise, with firm resolve and clear vision, to establish the Cause of Universal Peace. They must make the Cause of Peace the object of general consultation, and seek by every means in their power to establish a Union of the nations of the world. They must conclude a binding treaty and establish a covenant, the provisions of which shall be sound, inviolable and definite. They must proclaim it to all the world and obtain for it the sanction of all the human race. This supreme and noble undertaking—the real source of the peace and well-being of all the world—should be regarded as sacred by all that dwell on earth. 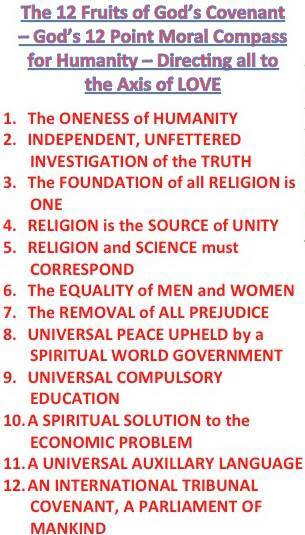 All the forces of humanity must be mobilized to ensure the stability and permanence of this Most Great Covenant. In this all-embracing Pact the limits and frontiers of each and every nation should be clearly fixed, the principles underlying the relations of governments towards one another definitely laid down, and all international agreements and obligations ascertained. In like manner, the size of the armaments of every government should be strictly limited, for if the preparations for war and the military forces of any nation should be allowed to increase, they will arouse the suspicion of others. The fundamental principle underlying this solemn Pact should be so fixed that if any government later violate any one of its provisions, all the governments on earth should arise to reduce it to utter submission, nay the human race as a whole should resolve, with every power at its disposal, to destroy that government. Should this greatest of all remedies be applied to the sick body of the world, it will assuredly recover from its ills and will remain eternally safe and secure. Observe that if such a happy situation be forthcoming, no government would need continually to pile up the weapons of war, nor feel itself obliged to produce ever new military weapons with which to conquer the human race. A small force for the purposes of internal security, the correction of criminal and disorderly elements and the prevention of local disturbances, would be required—no more. In this way the entire population would, first of all, be relieved of the crushing burden of expenditure currently imposed for military purposes, and secondly, great numbers of people would cease to devote their time to the continual devising of new weapons of destruction—those testimonials of greed and bloodthirstiness, so inconsistent with the gift of life—and would instead bend their efforts to the production of whatever will foster human existence and peace and well-being, and would become the cause of universal development and prosperity. Then every nation on earth will reign in honor, and every people will be cradled in tranquillity and content. A Universal House of Justice — with the Davidic King, the great grandson of ‘Abdu’l-Baha, as its President — is the medicine for this sick world. This body is the Supreme Institution of the Kingdom of God, established on earth as it is in heaven in fulfillment of the Lord’s Prayer that Jesus gave and told the Christians to pray for. This body, the Supreme Institution of the Kingdom of God on earth as it is in heaven, is the Universal House of Justice that all the nations of the world will joyously and unhesitatingly belong to. The purpose of the living, functioning, descendant of King David through Baha’u’llah and Abdu’l-Baha at its head is so we can recognize Baha’u’llah’s true Universal House of Justice from fakes, frauds, and imitations. (see Isaiah chapters 2, 9, and 11) The hearts of all mankind shall willingly and eagerly turn their trust and loyalty to this world governing body, as all the people of the world shall see with their third eye opened — of their intellect — that this is the plan that God Himself has given us all for the salvation and redemption of all human kind. Already the world has seen three prototypes, or imitations, of this world Parliament. First in the World Court, secondly in the League of Nations, and third in the form of the United Nation’s Organization. These three bodies, however, failed to achieve the unifying force to unite all the peoples and nations of the world, as these failed attempts did not originate from God but from the imitation of man, they lacked the spiritual endowment of authority to unite the world together as one family, one race of humanity. 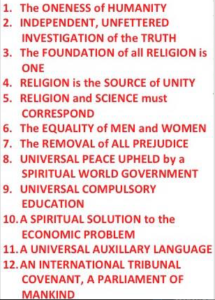 This government, the Kingdom of God on earth as it is in heaven, does not originate from the minds of men but has been delivered unto all humanity from God Almighty via the Supreme and Universal Manifestation of Himself, which is the second coming of Christ in the person of Baha’u’llah. The world commonwealth outlined by Baha’u’llah is governed by the Universal House of Justice, this is a World Parliament freely elected by the peoples of the earth, currently in its appointed stage. It must have authority to enforce its decisions upon any dilatory or rebellious member of the commonwealth, and such action must be as swift and certain as it would be in the case of an individual who breaks the law. No such world government an succeed unless backed by the authority of the whole human race. 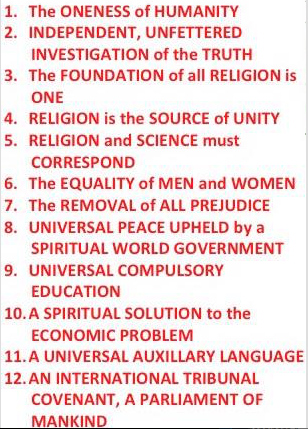 This is the principle of unity and oneness of mankind with the complete abandonment of prejudices, on which the future of mankind depends. 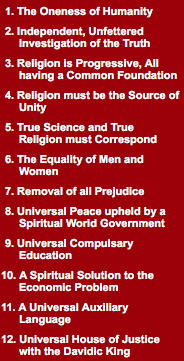 This world authority must, in the interests of the whole human race, establish law in the place of war. It must strictly limit the armed forces of every nation according to their internal needs. It must plan and put into practice a world system of economics which will remove the present evils of waste, inferior quality, want in the midst of plenty. It must assume sole control over tariffs, excise, sources of raw material. It must foster a spirit of world civilization among all the people of the planet. The president, that is the Executive Branch of the Universal House of Justice, is that promised return of the descendant of the lineage of King David, reestablished by Baha’u’llah. The office of President carries with it the right and obligation of the Executive Branch, a duty which is permitted to no one else, as defined and delineated in the sacred Will and Testament of Abdu’l-Baha. The Davidic King is therefore the permanent head of the Universal House of Justice, which is the executive branch of the New World Order, God’s Kingdom on earth as it is in heaven. Together, and inseparable, the Universal House of Justice with the Davidic King, Abdu’l-Baha’s great grandson, as its President, forms the nucleus of the Kingdom of God on Earth as it is in heaven, the New World Order. As this institution has been established with its component parts, its organic institutions, and is functioning with efficiency and vigor, it is, by the unfolding of world events and the predestined Will of Omnipotent God, being projected to all the people of the world. Not by the will of man or any scheme or plan of any group of people, but by an act of Almighty Providence alone, this victory is given over to the people of God. Coinciding with great world calamity, catastrophe and social upheaval, the divine banner of the genealogy of Baha’u’llah is now being unfurled and upraised above the heads and ramparts of all the onlooking and terrified people of the world, showing the continuation of the line of David in the Executive Branch of this Universal House of Justice, which is to last forever (see Psalms 89). Such is the inescapable mind and plan of God; for by this method, world disaster and calamity contrasting the good news (gospel) of the proclamation of this Kingdom of God (Davidic), God has vouchsafed and made certain that His and only His Universal House of Justice should be asserting its claims and demonstrating its unfailing capacity to be regarded not only as the nucleus but the very pattern of the New World Order destined to embrace in the fullness of time the whole of mankind. 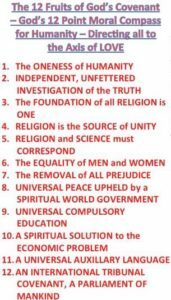 THE BAHA’l SACRED WRITINGS flow out from the Two Central Documents of the Baha’i Revelation, the Book of the Covenant of Baha’u’llah (entitled the Kitab-i-Ahd) and the sacred Will and Testament of Abdu’l-Baha’, which is “THE CHARTER” of the Kingdom of God on earth as it is in heaven (see World Order of Baha’u’llah, p. 144). All the other writings and teachings receive their life, their relevance, and their real inner spiritual force, meaning, and sustenance from out the wellspring of these two Most Mighty Documents, forming one single “scroll written (within) on the inside (the Kitab-i-Ahd) and (on the back) on the outside (the Will and Testament of Abdu’l-Baha’), sealed with seven seals” (Rev. 5:1 ISV). 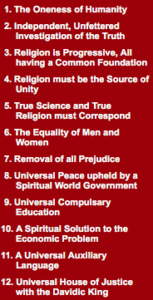 No person can, really in good faith, even consider themselves to be a Baha’i in truth unless they can be said to have first at least read and attempted to understand, let alone believed in and been obedient and faithful to the contents and provisions of these two Documents combined together as One single Scroll. This is something similar to what Jesus said, when he said that “to eat” is to come unto him (understanding the “bread” of the teachings) and that “to drink” (the wine of the Covenant that gives life to the teachings) is to believe! (see John 6:35 KJV). 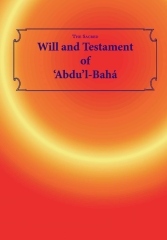 Abdu’l-Baha’ wrote the Will and Testament in three different parts at three different times. He sealed each of these parts, making three seals. On the back of the envelope where it was stuck down Abdu’l-Baha’ placed three more seals, and then on the front, where it was addressed to “the chosen branch,” he placed the seventh seal. The seven seals are thus on the outside part of this scroll, the Will and Testament of Abdu’l-Baha’, which was found after his passing with the Kitab-i-Ahd, the Book of the Covenant of Baha’u’llah, rolled up within. The Kitab-i-Ahd and the Will and Testament together comprise the prophesied continuation of the everlasting Covenant given in the Bible because in His Covenant, Baha’u’llah establishes the throne of King David as the Executive Branch of His Universal House of Justice. This everlasting Covenant was begun with Adam, passed down through Abraham and David, and promised by Jesus Christ to be established in the world today, 2000 years since his birth and first appearance. Baha’u’llah is a direct descendent of the exilarchs (the exiled monarchs of King David) who were taken into captivity into Babylon and Persia (‘Iraq and Iran) the land of the birthplace of Baha’u’llah. Through His son Abdu’l-Baha’, the throne-line of David continues down to this present Day. LEND an ear unto the song of David. He saith: ‘Who will bring me into the Strong City?’ The Strong City is ‘Akká, which hath been named the Most Great Prison, and which possesseth a fortress and mighty ramparts… Peruse that which Isaiah hath spoken in His Book. He saith: ‘Get thee up into the high mountain, O Zion, that bringest good tidings; lift up thy voice with strength, O Jerusalem, that bringest good tidings. Lift it up, be not afraid; say unto the cities of Judah: “Behold your God! Behold the Lord God will come with strong hand, and His arm shall rule for Him.”’ This Day all the signs have appeared. A great City hath descended from heaven, and Zion trembleth and exulteth with joy at the Revelation of God, for it hath heard the Voice of God on every side. READ ye the Evangel and yet refuse to acknowledge the All-Glorious Lord? This indeed beseemeth you not, O concourse of learned men!… The fragrances of the All-Merciful have wafted over all creation. Happy the man that hath forsaken his desires, and taken fast hold of guidance. PERUSED ye not the Qur’án? Read it, that haply ye may find the Truth, for this Book is verily the Straight Path. This is the Way of God unto all who are in the heavens and all who are on the earth. If ye have been careless of the Qur’án, the Bayán cannot be regarded to be remote from you. Behold it open before your eyes. Read ye its verses, lest perchance ye desist from committing that which will cause the Messengers of God to mourn and lament. This is the Day whereon the All-Merciful hath come down in the clouds of knowledge, clothed with manifest sovereignty. He well knoweth the actions of men. He it is Whose glory none can mistake, could ye but comprehend it. The heaven of every religion hath been rent, and the earth of human understanding been cleft asunder, and the angels of God are seen descending. Say: This is the Day of mutual deceit; whither do ye flee? The mountains have passed away, and the heavens have been folded together, and the whole earth is held within His grasp, could ye but understand it. Who is it that can protect you? None, by Him Who is the All-Merciful! None, except God, the Almighty, the All-Glorious, the Beneficent. Every woman that hath had a burden in her womb hath cast her burden. We see men drunken in this Day, the Day in which men and angels have been gathered together. All spiritually oriented (not of the materialists) Muslims must universally cease and desist this wrongful fighting against the People of the Book who are especially the Christians and Jews by ORDER of the true Universal Caliphate of King David alive in the world today sealed by the seal of the prophet in the Holy Koran. Those who do not are in infidelity with this decree and therefore are spiritually dead, as Muhammad has said in the Koran–the infidels deserve death–meaning they are spiritually dead–as Jesus said let the dead bury the dead–and that in this spiritual death Muhammad said they deserve it that is, they have their own reward. Infidels are only those who are first Muslim and then lose their fidelity–but if they become faithful again this condition of spiritual death (cut off from their rays of the Holy Spirit) that Muhammad says they deserve ceases; and they then have spiritual life through the acceptance of the Covenant of the Universal Caliphate of Allah–the throne-line of King David–that is a Jew–of Judah and King David and King Solomon, and the Persian Jews of Baha’u’llah and ‘Abdu’l-Baha, etc. The People of the Book are never “infidels” because they are never Muslims in the first place and therefore they are not required to submit to the Koran (and therefore are exempt by Allah in not following it) because they are already of the Covenants with Allah (God) of the People of the other Books of God such as the Bible and the Tanak and Gospel, etc. Get this straight, people. The Christians–the dead in Christ–who are spiritually dead and prophesied to rise first must lay down their weapons and immediately cease and desist invading the Islamic foreign lands. Jesus judges otherwise against them: “Then they asked him, ‘What must we do to do the works God requires?’ Jesus answered, ‘The work of God is this: to believe in the one he has sent’” (John 6:28-29, NIV). Muslims and Christians must respect the rights of the nation of Israel of the Jewish people. Jews must cease and desist the infighting and allow a better formation of the Palestinian independent state. WE, verily, have come for your sakes, and have borne the misfortunes of the world for your salvation. Flee ye the One Who hath sacrificed His life that ye may be quickened? Fear God, O followers of the Spirit (Jesus), and walk not in the footsteps of every divine that hath gone far astray… Open the doors of your hearts. He Who is the Spirit (Jesus) verily, standeth before them. Wherefore keep ye afar from Him Who hath purposed to draw you nigh unto a Resplendent Spot? Say: We, in truth, have opened unto you the gates of the Kingdom. Will ye bar the doors of your houses in My face? This indeed is naught but a grievous error.